El tema "Could you be loved" interpretado por Bob Marley & The Wailers pertenece a su disco "One love: the very best". 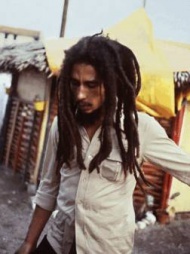 Ahora puedes escuchar y aprender la canción "Could you be loved" de Bob Marley & The Wailers. could you be loved, wo now - and be loved? could you be loved? could you be loved? no matter how you treat him, the man will never be satisfied. Escuchar Bob Marley & The Wailers Could you be loved Lyric Video.